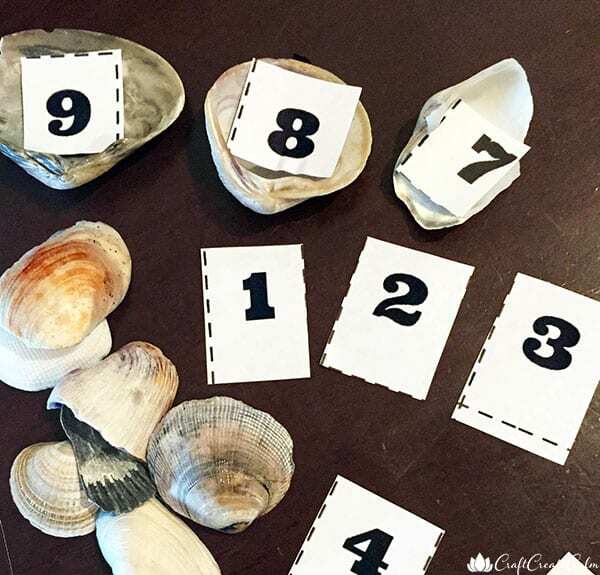 Rebecca from CraftCreateCalm joins our ABCs and 123s series today with a printable shell counting game. Warm days always make us want to go to the beach, and even though my two preschoolers already have a bucket of pretty rocks and shells, they can’t help but add to their collection every time we make the trip. 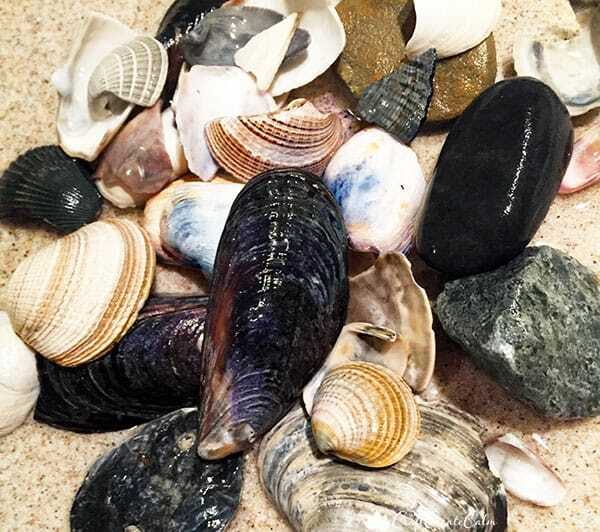 I use shells for art projects and learning activities throughout the year. My tweens and preschoolers had a great time last summer making bright framed shell wall art, and we’ve given the grandparents a home-made stepping stone for their rose garden. Today I’m sharing one of our favorites games made of shells! 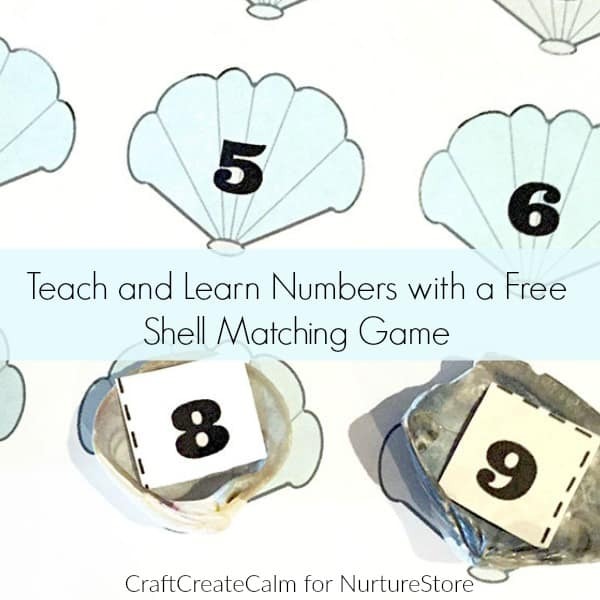 Shell Number Match-Up is a printable game mat you can use to teach your kids ages 2-6 number recognition, counting, number order memory, and even early math skills! Fill a bowl or sink half way with water and add a few drops of dish soap. Kids can wash the sand off of the shells in the soapy water. Rinse and dry the shells. Have your child (or your can do this step if those little hands aren’t quite ready for cutting with scissors) cut along the lines of the number sheet to separate each number. Glue one number to the inside of each shell. You may need to trim the paper around the numbers for smaller shells. Let dry. Now we’re ready for the fun part of this activity; playing the game! There are three ways to play Shell Number Match-up. Set the shells out number side up next to the seashell printable game mat. Ask your child to match each real seashell with the same number on the game mat. Mix the numbers up and take turns to make it a two person game! Set the shells number side down on their corresponding shell number on the game mat. Call out numbers 0-9 and see if your child can remember where they are on the mat. Leave found number shells facing up to show number order as the game progresses. Older preschool to kindergarten-aged children may be ready for basic math skills. Set out two numbered shells such as 1 and 2. Ask your child to find the sum on the shell game mat. 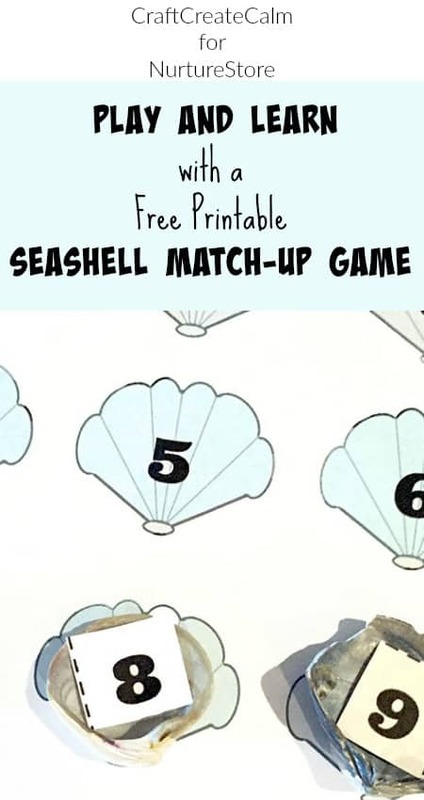 We have so much fun playing Shell Number Match-up together, I hope you do too! Rebecca is a mom of four, homeschooler, coffee lover and SAHM turned WAHM. She shares learning activites for ages preschool to tween, household management tips and crafts/diy at CraftCreateCalm. Find more great learning activities for kids by following CraftCreateCalm on Pinterest!